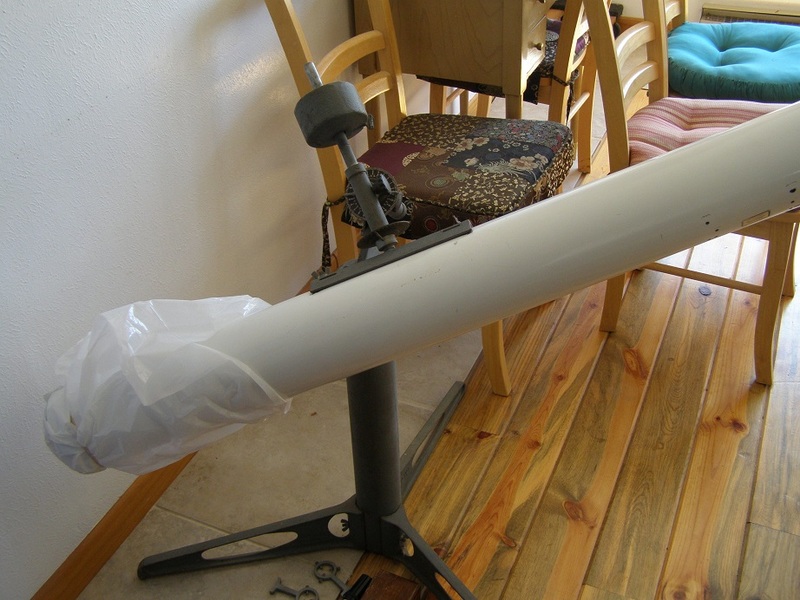 Hi, we have received an Edscorp 6" Reflecting Telescope, like this one. There are a couple of issues, the mirror got moisture on it and has black dots on it. The other issue is the piece that connects the white part with the base is frozen, so how do you get it apart? of info how to do that on this site. mechanism has seized up and does not move freely. I had that particular problem with my Edmund 6" f/8. What worked for me to free it up was put the seized gear in a 250 degree oven for 45 minutes. would not expand as fast. It freed up as soon as it came out of the oven! I recently also purchased a 6" Space Conqueror (1967) with a very dirty mirror. It is still very nice after proper cleaning. The Edmund mirror is probably pyrex and of good quality. It can be recoated if necessary, but I would not replace it. Photos of the mirror would help. Others can probably point you to other companies that do this. Edited by Marc-Andre, 14 September 2018 - 04:40 PM. These are called a First Surface mirror. The special coating is on the front, not on the back like a bathroom mirror. This makes them delicate. The aluminum coating is usually protected by a top clear coating, but that protective overcoat is likely thinned or gone from age. It isn't difficult to clean it correctly but that can be a bit of an art none the less. Don't ever rub the surface. 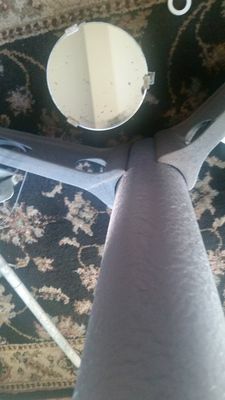 The glass itself is probably OK and having a telescope mirror recoated is fairly common, and fairly cheap for this size mirror. Most likely it could be cleaned correctly and used unless it's been badly scratched up from rubbing. It's hard to say for sure without looking at it. Pictures of the mirror would help but there will still be a lot said for personally looking at it. Most astronomy clubs would be happy to help. Most astronomy clubs will have some sentimental sap that would love to be all over helping you with a vintage classic like a Super Space Conquerer (SSC). I have one. I have a few - I think, yeah at least two and something more, more or less. The mirrors can have quite a bit of general stuff on them and still give great views. Cleaning a mirror is held off on till fairly ugly. Only broad surface area scratches and hazy coatings are an issue, and really dirty mirrors. Specs and spots and typical dust and deposits are not a huge deal. There is no way to know exactly what is frozen on your scope. Something on the mount is being assumed and that could be anything from a motor to a shaft in the housing. Right about now you have a lot of people in this forum that would love to see pictures. Pictures with descriptions. It will the only way to go. Some here can get you links to many restorations of these. I lusted for one of those in the early 1970s. Thanks for all of the advice, I will get some pictures of it! Awesome. If you know how to use 'PAINT' then make like John Madden (before your time?). Reference the pictures with detailed descriptions of the problems. Here are the pictures of the Edscorp 6"
Mirrors are funny with photos, not to mention the parabolic shape of the reflecting surface. Using my best experienced guestimate, I'd say the mirror can be cleaned CORRECTLY and used as is at least well enough to check out the scope. oh, you don't have a 6" scope. Scope size is not by the diameter of the tube. What is the diameter of the mirror? 4.25"? It's probably spherical and not parabolic, not that you could tell, and it's usually a good performing mirror for the accuracy of it's surface. upper right with the socket set. That's the saddle with the straps attached to it. The long shaft is the declination (DEC) shaft with the saddle on one end and a stop collar attached to the other end. 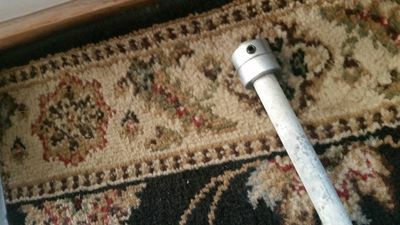 The stop collar would slide off, and that long shaft would go through the hole in the little casting barely visible off the top center edge of that photo. That little casting is the DEC housing that that DEC shaft slides into. oh, be carefull about that brown circle by the DEC housing with the pointer nails going out to the numbers. That's the RA setting circle, kind of delicate stuff called bakelite. People like to find those intact, they often aren't. That DEC housing is also attached to a shaft so it too can rotate in another housing which is fixed. Time for a side picture of that whole assembly that sits on the top of that stand. The saddle and DEC shaft assembly and all that stuff on top of the stand is the MOUNT, and that is where something is frozen up that you mentioned, but no telling what yet. and I have no idea what Ijust printed with what I hit so checking. Upper left with the white tube. That looks like a nice telescope tube you have there. That's the counterweight by the lantern and it looks nice. In fact, it ALL looks like a nice scope as well as can be seen in the photos. I don't see an allen wrench set. You'll need one. I would say that the weight slides on the end of the DEC shaft, after you put that shaft and saddle back into the housing, but you may already know all this. Where are you at on it? 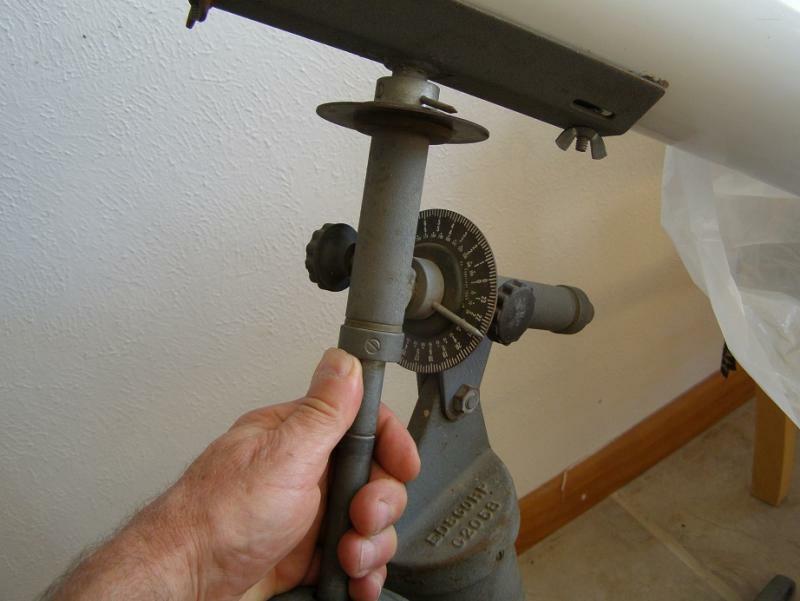 Put that mirror assembly up somewhere and lay a Clean (with a capital T) cloth over it, or fresh paper towel, NO rubbing. No, I'm not going to launch into a full restoration. Describe what's frozen. Edited by apfever, 15 September 2018 - 12:01 PM. Yes, I agree that looks too small to be a 6" mirror. Thanks for all of the advice, we got it together, the part that you dial up and down is corroded, and the little mirror on a metal stick came off the stick, the part that you screw it down on the broke. Can I buy the whole assembly for the it? See pictures. Also it is an Edmund. Edscorp is a semi acronym for 'Edmund Scientific Corp.' Got the Edmund part. Here's one of mine, I have two complete of this model. DO THIS SOON! The picture of the whole scope shows the two stop rings on the weight shaft, one on each side of the weight. The stop ring above the weight needs to go up against the shaft housing. That top stop collar also needs to be set pretty firm but don't kill it with the allen wrench. 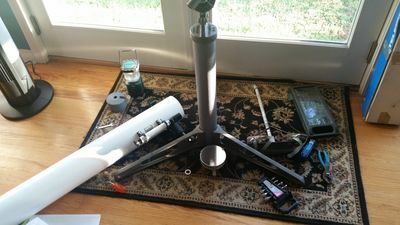 IF you rotate the scope and weight shaft assembly around so the telescope is closer to the bottom and the weight closer to the top, then that whole assembly will slam down through housing and impact the stop ring HARD. Reference my picture: Hold the shaft while you thumb the ring up to the housing. You want it to sit just touching with a very light tension feel. You can rotate the shaft using the scope like you would while viewing and you just want a light feel, not full loose. This should be light thumb pressure, then tighten that collar pretty good. Hopefully you cleaned the shaft a little and put some lube on it if you want to leave it assembled for use now. At least a wipe so no dirt, grit, or grime. I took the picture with the scope inverted from a normal use position. Sometime it can end up like this, reasonably common. This shows how the whole shaft assembly could fall through the housing till it hits that collar, if the collar is not snug correctly. 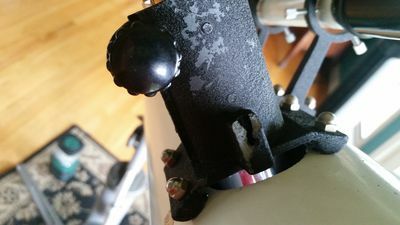 My stop collar has a straight slot set screw, not an allen head. I love your descritption. The corroded part that you dial up and down is the Focuser. It holds the eyepiece and you need some kind of eyepiece to put in the focuser to use the scope. Does the dialing up and down work OK? That is how you focus. It's called racking. 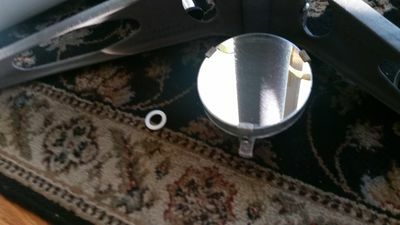 If the focuser racks up and down nice, then you might consider a non original assembly that holds the little mirror instead of that metal stick. There isn't going to be a good repair to go back to the stick and the stick thing isn't considered a great design anyway, though I have no issues with them (I also have the inside scoop in experience to deal with them). The substitute assembly would make this scope a real gem if the mirrors are good. It's called a spider and this a picture of one. The little mirror is called the Secondary. You have to get the secondary held out there somehow. You have a little work to do before 'first light'. The focuser racking is easy to adjust if it seems sloppy or frozen, anything close to middle of the road is fine for now. Sloppy would be rattle loose and practically fall up and down under it's own weight. The racking is sort of rough and it slips, so can you buy or find the whole piece with the focuser with the secondary? Or find one? Does anyone know where to get a new focuser and secondary for my 4.25 Edscorp telescope? I want to get it working! Also what kind a small one can I take on a sail boat, it's a keel boat, so it doesn't tip over, but could get sprayed with water. the stalk. There are no new parts but you may get lucky. too for about $125 so put in another want add if interested. I think 30 posts are required for the swap forums at the bottom of this site but not the classifieds. The classifieds can be found at the top of every page in the menus. The Edmund Astroscan would be good for a boat. It needs to be put in a bag to keep it dry. No scopes are good for getting sprayed with water as a regular possibility, but the astroscan would be a good one to be water 'resistant' if water is inevitable. I've taken mine on a snowmobile through some rough terrain, steep and deep. It's pretty durable. Rita, your focuser may just need some grease and tension adjustment, it's a little difficult to detail a scope refurbish through chat. If I had your focuser, I could check it out in a few minutes and have it greatly improved if it's just basic adjustments. Or I could tell you it's toast in a few minutes, but this is all hands on stuff. Do you have eyepieces? 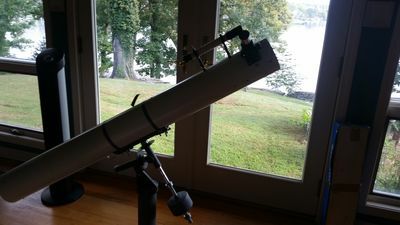 Your best all around evaluation would be to take it to a local astronomy group or star party. Then I'd give you the spider I showed with the mirror. You have a nice looking scope, with some nice features like intact setting circles. You also have the longer DEC housing which is nice. You need a functioning focuser, a secondary assembly of some kind, and an eyepiece. Then the optics will need to be collimated which is easy with experience - a local astronomy group. IF you were next door, I'd probably already have you looking through it. Thank you so much for all of the information. I will be on vacation for a couple of weeks, so I won't be able to work on it. I did, however order a spider that I think that I can rig up to work. 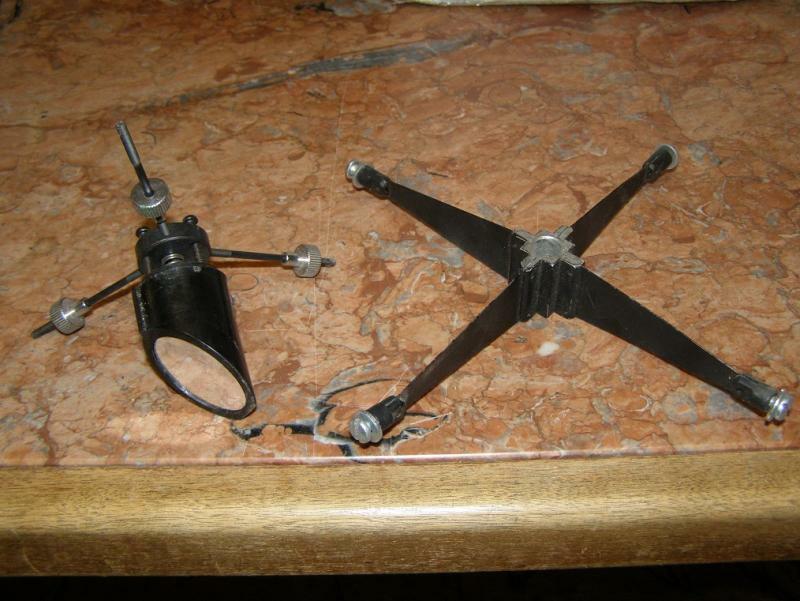 The focuser is still intact, but sort of slips, it still works.